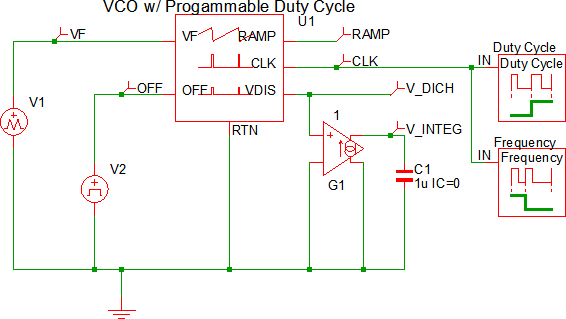 For a VCO with a 50% duty cycle, see the Voltage-Controlled Oscillator w/ 50% Duty Cycle topic. The following table describes the pins on the VCO symbol. OFF I On/Off control voltage for the oscillator Oscillator runs when the OFF voltage signal is less than 2.0V. Once the oscillator is running, it stops when the voltage at the OFF pin exceeds 3.0V. Once the oscillator stops running, it restarts when the voltage the OFF pin drops below 2.0V. RAMP O Saw tooth ramp voltage output This output allows you to probe the internal oscillator ramp voltage. 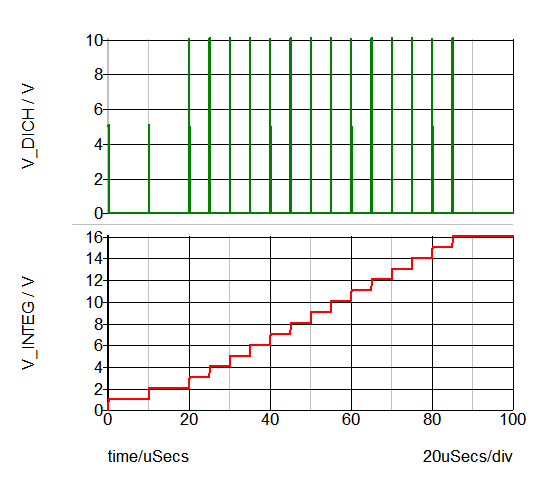 The ramp voltage frequency is the same as the clock frequency. The slope of the ramp is linear for both the rising portion as well as the falling portion. The clock frequency is controlled by the VF input. 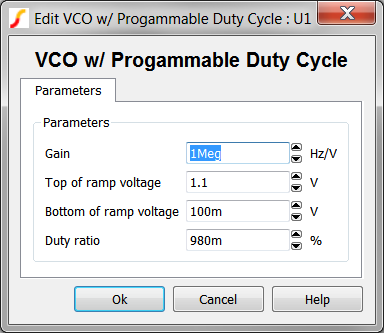 The clock parameters are set in the input dialog box described in Editing_the_VCO. V_DICH O V_DICH output voltage V_DICH provides output voltage signal. 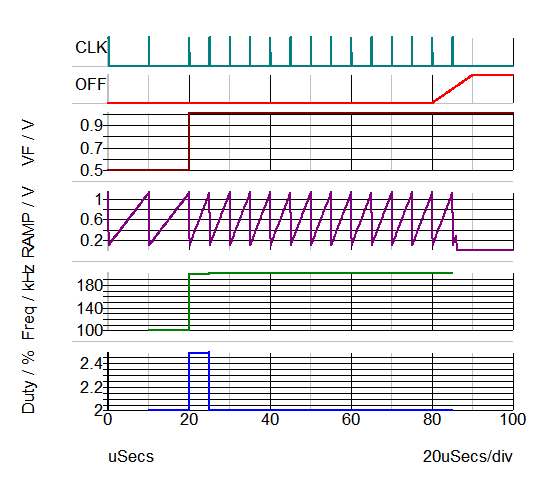 When this output is connected as shown in the schematic example below, the V_INTEG signal is proportional to the number of clock cycles. Gain The gain of the VCO is described in Hz/V. A VCO with a Gain parameter value of 100k will oscillate at 100kHz when the VF pin voltage is 1V. When the VF pin is 5V the same VCO will oscillate at 500kHz. The test circuit used to generate the waveform examples in the next section can be downloaded here: simplis_070_vco_programmable_duty. The VF pin changes between 0.5 and 1V at 20us. The resulting oscillator frequency changes from 500kHz to 1MHz. The OFF pin is asserted with a PWL voltage ramp starting at 80us. The oscillator turns off when the OFF pin voltage crosses the 3V threshold. The waveform below shows the integrator output proportional to the number of clock cycles. The V_INTEG voltage increases 1V for every oscillator cycle.